Main interfaces is very similar to PEiD but with some great functionalities. With Rip button all resources can be extracted at once and saved into current directory. With tools menu user can get a lot of information inside PE files such as registry key, OEP, save resource section, XoR permutator (easy to reverse any reversed string such as ROT13) and many more. File Menu offer to you multiple options about taking action to your analyzed file. WYSIWYG. 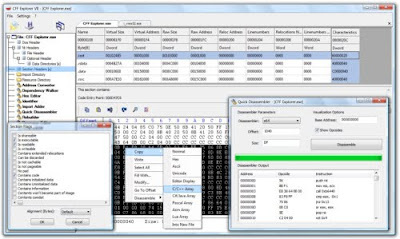 This one of most advanced freeware tools for Reverse Code Engineer. Created by Daniel Pistelli, a freeware suite of tools including a PE editor called CFF Explorer and a process viewer. The PE editor has full support for PE32/64. 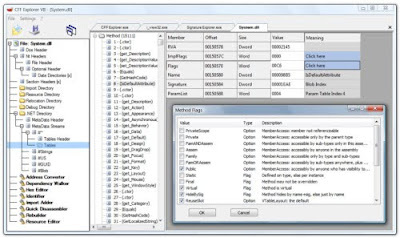 Special fields description and modification (.NET supported), utilities, rebuilder, hex editor, import adder, signature scanner, signature manager, extension support, scripting, disassembler, dependency walker etc. First PE editor with support for .NET internal structures. Resource Editor (Windows Vista icons supported) capable of handling .NET manifest resources. The suite is available for x86, x64 and Itanium. OllyDump is one of advanced memory dumping tools. It is easy to use with OllyDbg as a plugin. Once the process is being debugged at runtime, it will be automatically search for PE section. But this tools does not give you automatically an OEP for any compressed PE file. You still have to find their OEP offset manually and write down the offset to the OllyDump window. The picture below show you how the OllyDump plugin works for dumping UPX packed file. Just simply add your founded OEP to the Modify box and hit Dump button to save as a dumped file. You can edit the listed section for your own usages. You can easily dumping PE file without need to highlight all the debugged code and choose 'Follow in Dump > Selection'. This way sometime does not produce an accurate result. You can find OllyDump here or here.